WCMS Is The Answer for your Dealership's eCommerce needs! As a dealer, you know that part of formula for making sales is to make life easier for the customer. You do this everyday when they come into the dealership, but you can also assist customers from the comfort of their homes by making sure that your website is easy to navigate and performs well. The amazing WCMS platform allows you to do this as it is the best software for creating SEO-friendly eCommerce websites. 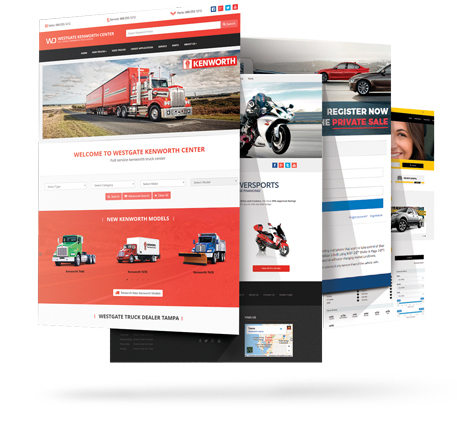 If your customers want to see your inventory or purchase customization parts for their vehicles, they can easily do so via your versatile WCMS website! Dealerships can generate a solid source of additional income by creating a standalone eCommerce website for selling parts and accessories. These sales are critical to increasing profits and with effective marketing your WCMS website can work wonders for your revenue stream. Compete on the open Internet Market. The WCMS platform allows you to create a website that will give your dealership the ability to make money 24 hours a day, 7 days a week. This is because once your website is live, customers can access your inventory of vehicles and accessories at any time of the day from any place that has access to the Internet. Be shared through Social Media. Place links on your website that allows customers to easily show their friends and family on Facebook and Twitter what your dealership has to offer, and how easy you made their purchase experience. Dealership’s personnel can make changes to inventory on your WCMS website in a matter of seconds, ensuring that your website is always up and online. The WCMS platform can be operated without the knowledge of advanced Web programming skills. WCMS websites allow you to create a secure environment for Web payments while also giving you the ability to redesign your store’s interface to better serve your customer’s needs. WCMS is the ultimate answer to your eCommerce needs. If you’re ready to push your revenues to another level, contact us today and let’s get started! Have any quеstions? Contact Us.